It all started in the early 1940s. The first Kanban system was developed by Taiichi Ohno (Industrial Engineer and Businessman) for Toyota automotive in Japan. It was created as a simple planning system, the aim of which was to control and manage work and inventory at every stage of production optimally. The Kanban basic principle Kanban is a decentralized material flow control that is based on the pull principle (collection obligation = request material if required) based on consumption, in contrast to the classic push principle (delivery obligation = automatic forwarding). 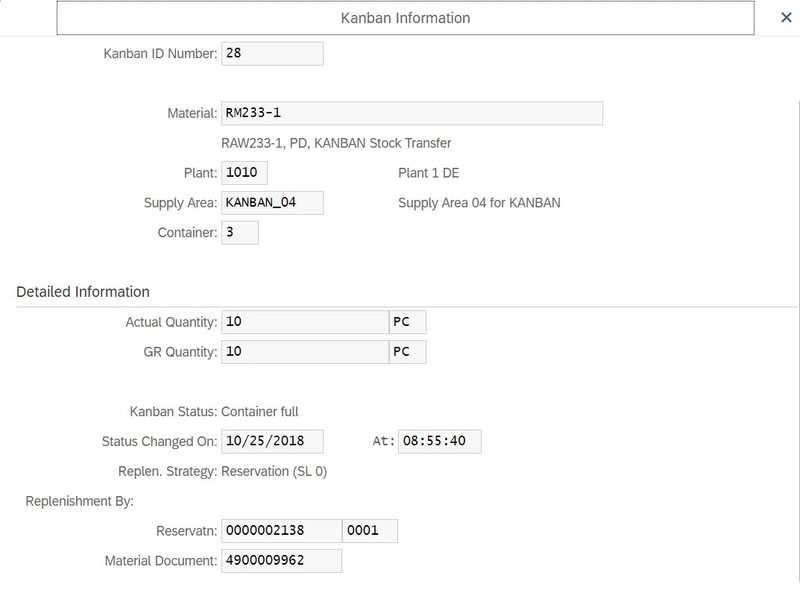 In contrast to traditional production planning and control systems (PPS systems), the Kanban method requires the consuming departments to request the material they require according to the production order from the upstream departments in time. The required material is delivered to the consuming points directly from the responsible warehouses. 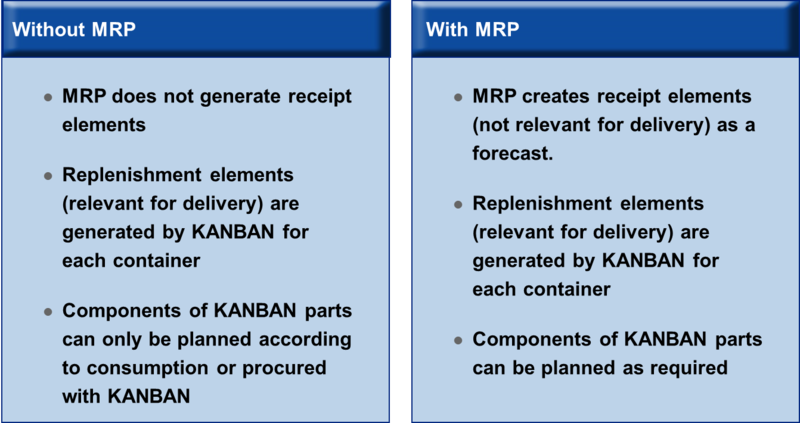 Replenishment using Kanban is possible with in-house production, external procurement, or stock transfer. A series of new replenishment strategies will be available for each of these three options coming with Release 1902. 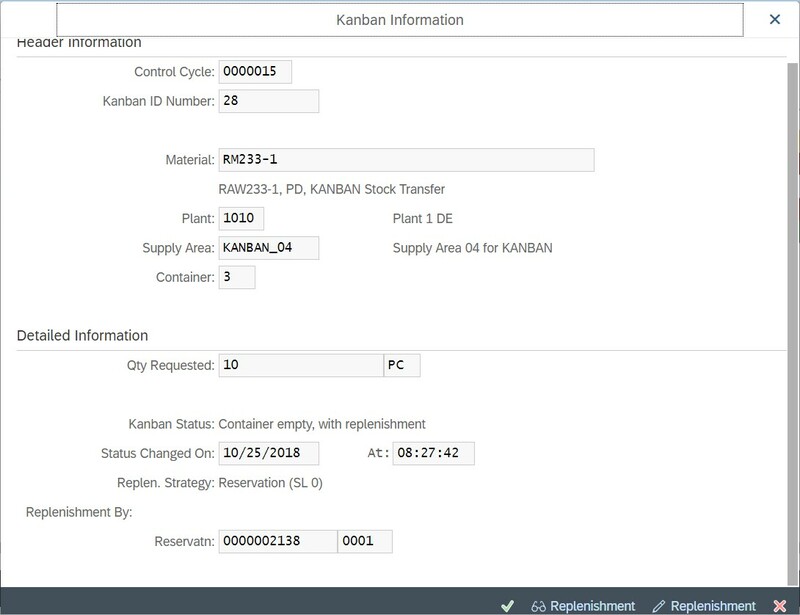 Furthermore, SAP introduces a new App to set the Kanban container status via Barcode. This will enable shop floor operators to easily trigger material replenishment for production when scanning the respective barcode for “Empty”. After getting back the full container from warehouse, the operator can scan the container again and adjust the received quantity and batch. Furthermore, you can extend the following classic apps according to your business needs: Control Cycle Maintenance (PKMC), Kanban Board: Supply Source Overview (PK12N) and Kanban Board: Demand Source Overview (PK13N). You can also extend the Adobe output form PP_KANBAN_CARD according to your needs. Select Classic Kanban and enter Material, Production Supply Area and Lifecycle Status (created) and choose Continue. Specifiy the number of Kanbans, Container Quantity and Load Carrier. Select Replenishment Strategy PD10 for “Reservation” and enter Storage Location. Set Lifecycle Status released and Save Control Cycle. Press Display Kanban to unlock previously created containers. Select both lines and choose Manage Materials to review stock and requirements for both MRP Areas (Plant 1010 and Kanban1010). Enter Plant (1010) and previously created Production Supply Area (Kanban_04). In addition, you can select the material and choose continue to open the Kanban Board. Note: Select the change Layout button to add additional columns for Actual and Required Quantity or Reservation. Now you can review the details of the processed container. Select the line again and choose the Display Kanban Information button to review the Stock Transfer Reservation for the material. Enter Storage Location (101C) and Plant (1010). Choose Continue. Select the row of the empty Kanban Container (Status: 2) and set in Transit (after replenishment). System will issue a success message (1 Kanban container processed). Kanban status is 4 now. Enter Plant (1010) and Production Supply Area (Kanban_04) again and choose Continue. 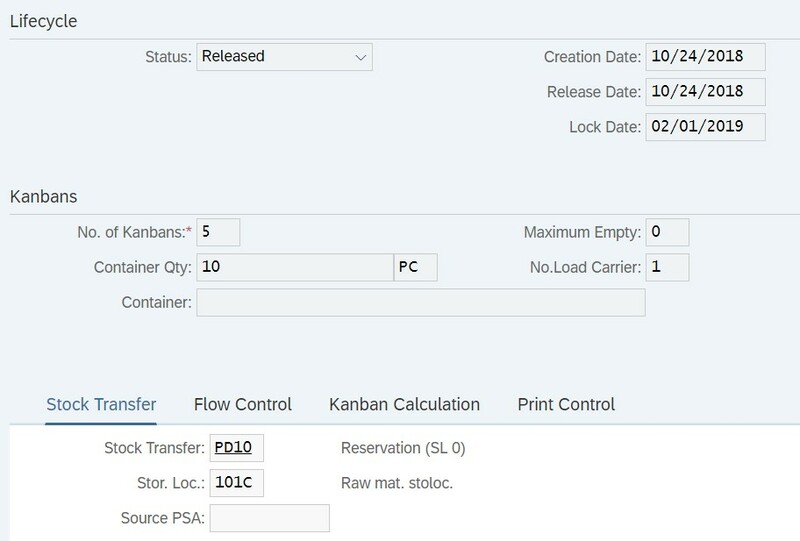 Select the row of the Kanban container in transit and set to full (Operator receives the full container in production). System issues a success message (1 Kanban container processed). Select the row again and choose Display Kanban Information button. Select Display and enter material document number. With this app you can select or scan kanban containers to trigger kanban status changes. Typically, a container status is changed from “Full” to “Empty” when the material in the container has been consumed and thus the replenishment process needs to be triggered. Later, the container status will be set to “Full” again, the container quantity will be increased, and inventory will be moved to or received at the production supply area to be available for consumption in production processes afterwards. You can use this app to select or scan kanban containers to trigger kanban status changes. Whenever a kanban container is scanned or entered, it is first collected in the Entered list, the status change is not saved immediately. Before saving, this allows you to adjust the target status, and optionally set the batch (if the status is set to “Full” and the material is batch managed), and adjust the quantity manually if needed (if the status is set to “Full”). For this, the containers can be selected one-by-one in the Entered list and then modified in the details area. If a container was scanned or entered accidentally, it can be removed from the Entered list by clicking Remove at the top of the details area. Once all containers are entered and manual changes are done, the status change is triggered by pressing Save. After this step, all saved containers are moved to the Saved list.